sticky and gooey with life. cradling seeds in its belly. 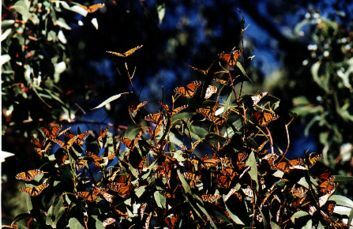 *This poem was inspired by the lovely monarchs, the champions of butterfly migration. They gather in the Big Sur area (where I was from Sept-Nov of 2009) starting in October and migrate north in January. It is a spectacle to see them flying everywhere and clustered so close together on Eucalyptus trees.